Large Audience Display Systems LLC ('LADS' for short) is pleased to announce our new 3D-720° cylindrical form factor screen-display systems--with patented seamless-mapping of recorded and live-streamed 3D and 2D full 360° panoramic video. The new large-screen form factors feature proprietary doubled-depth 3D-720° (and 2D-720°) displaying of full-panorama, viewable from thousands of 'Dual-Perspective' POVs surrounding each LADS screen. This patented 'missing link' feature now makes possible an exhibition of stunning full-panorama VR/AR, seamless Live-3D eSports and Live-3D Concert content--before large audiences. See our 3D-720° double-depth vs. 3D-360° imaging-comparisons immediately below. Each empowered by a host of patented features (see extensive 'Technically Speaking' listing below), LADS' screen-displays take aim at providing: Best-in-Class 3D and 2D immersive/panoramic display systems for a wide range of mid-size to large-size audience venues; a 'full-panorama Game-Changer' for eSports Championships embracing 360°-panoramic, and soon-to-come VR/AR gaming, content; and, for staking an ideal upscale 'immersive presence' at keystone retail venues and prime digital-signage sites--in both indoor and outdoor settings. Patented features include: 360° Full-Panorama-Gaming (and Live Interactivity), Live 3D-720° / 3D-360° Concerts, Sports and Digital Signage content (2D-720° too)--and much more. More Than a New Display / Form Factors Patent -- LADS-IP is Literally a 'Game-Changer' -- Here's why: take a leading/single video-game, bring it to a large-audience venue presented on flat 2D display screens for a World Championship; back the game-co./effort with major investment from a single leading China-Tech co. and...? -- a new sports-league: 'Major League Gaming' (MLG) is born, and thrives. That's great for 2D-games only needing flat screens, but how do you take that and move it in a BIG way to a whole new level / league? (And maybe even end up owning a good portion of it too?). That poses a few other questions: Could advanced form factor screen-displays, exclusively capable of live-streaming, seamlessly mapping and displaying any 3D and 2D eSports, VR and AR in Full Panorama literally be in (establish a basis for) a 'League of Their Own'? LADS thinks so. Consider: should we still be using century-old display form factor flat-screens, literally 'out-of-their-league' for displaying the best immersive, player-encompassing 3D content now being built into the latest eSports, VR and AR gaming-tech? The fact is, flat screens would in effect relegate such 360° content 'benched'--out of the game / sitting on the sidelines. Not exactly what the leading 360° eSports, VR and AR game-co.s will want. Surely when VR/AR gaming debuts in large-audience venues they'll want their state-of-the-art games seen and experienced in a BIG way. How do you stream, effectively-represent and display 360° full-panorama and surrounding-immersive game-content on flat screens? And, why be satisfied with no direct interaction being provided between players (and/or attendees) on flat passive-displays used at eSports Championship Games? These questions underscore that there is a vacuum in mid-size and large-size audience display systems, and how a 'Better-than-Flat' solution is needed for state-of-the-art game content exhibition -- that is soon coming, is anything but flat, and will considerably raise the bar. Instead, consider this: What if, with a comparable backing by one or more other game co.s (nedding their 360° content stunningly / fully exhibited), and a similar level of investing made by one or more major tech-co.s -- a New Immersive-3D eSports, VA and AR Gaming League could be built and thrive? Wherein, the panoramic screens provide a patented displaying of 360° eSports, VR/AR video-game content; are equipped to stream, map and display seamless Live-3D (and 2D) 360° content and player game-action/interactions. The proprietary screen-displays can be dynamically positioned (and/or tilted) in any manner up/down/before their viewing audiences; offer a patented 'dual-perspective' circularity-of-action wherein sprites/objects controllable on the screen by competing players at the venue, dynamically moved anywhere on or around the screen-displays do so such that sychronous sound precisely tracks their motion/panning action; where audience attendees are also empowered/invited to interact with a game and/or live screen content via their handhelds, and even have content/new 'digital merchandise' exhibited on any 360° screen live-streamed directly to their personal wearables/handhelds; where screen interactivity also includes multi-venue attendee and/or player interactions, and more. Where the screen-displays generate a brand recognition--being 'Seen in all the Right Places'. Imagining a Game-Changer: a large-scale oval/arena-shaped LADS screen-display, with synchronous surround-sound, descends to floor level before a large-audience. Portraying a gladiator-style arena that surrounds two teams of eSports or VR-game players the champions dynamically interact with the immersive game-content around them. The stadium or arena large-audience, seated along various row-heights and surrounding the screen, take in the largest 360° eSports, VR and AR gaming-panorama experienced anywhere. The arena-scene action is also broadcast to viewers at home, and can exclusively be broadcast concurrently to other large-venues. The arena-shaped screen's 720° form factor exhibits stunning live-streamed 3D and/or 2D interactive imagery seamlessly about its exterior and interior perimeter-surfaces. Positionable and chameleon-like, the arena-shaped screen-display becomes the dynamic interactive battleground-medium on which each new 360° eSports, VR or AR game, match or round is brought to its respective players and large audiences. LADS-IP even includes the 720° display of 3D (and 2D) camera-ring captures -- such that full-panoramas recorded and/or streamed live from drones or small lighter-than-air airships capture any and all arena or stadium wide action and that of their audiences. More about the market: You're probably aware, gaming championship viewership has exploded, taking in more viewers than traditional/major sports. eSports/gaming now takes in more revenues than the entire international film industry (e.g., one game alone earns more than all Harry Potter movies combined). Colleges are granting full scholarships to major ePlayers expected to draw large crowds (revenues) at their own venues. Even new eSports-dedicated large-venues are now being built which will surely need more than a century-old flat screen approach to effectively engage and interact with large audiences, and to be truly VR-game / AR-game ready. The foregoing features, and various others (see our extensive 'Technically Speaking' list below) are among the differentiators LADS envisions as literal 'Game-Changers' -- providing a sound basis on which a new, 21st-Century Major Gaming League can be founded, taken to whole new levels and thrive. In other words, if you're company is looking for a Next BIG Thing in large-format display-tech, sure to be seen 'In a League of its Own', and which also happens to have a comprehensive patent position -- this is it. Shattering the Limits of the Single-Person VR/AR Viewing Experience -- VR and AR Head Mounted Display (HMD) content is by design meant to be stunning in its immersive and panoramic viewing experience--to the single-person wearing the HMD. But therein lies the marketing problem: How do you effectively increase awareness of VR/AR content when it's designed to be seen and experienced by just one person at a time? Or better yet, how can you get your content regularly seen and experienced by mid-size, large or even massive audiences? Constraining the 360° content to a conventional rectangular screen (box-shape) either grossly-distorts it, or portrays only a minority-fraction of it--like viewing it through a keyhole. Similar problems are encountered with stunning 360° HD and 4K panorama now being captured by cutting-edge drone and camera-ring devices. But absent an effective displaying means for the full 360° 3D or 2D captures, only a small-fraction of the full panorama-size is what's being shown / represented (again, constrained within a 'rectangular box'). That's like going to an IMAX movie and being allowed to see no more than a tenth of the film's full immersive imagery at a time. It just doesn't make sense. If you've got stunning VR/AR content or beautifully-captured panorama to show -- it's time to think out of 'the box'. Whether you're viewing an interior, exterior or both surfaces of a LADS screen-system, a full 360° immersive scene is always presented to a viewing audience. Note in the images at the top of page, when the panorama is imaged in 360° on both the exterior and interior surfaces how the outer and inner 3D panoramas complement each other. By combining two 3D depths of field--a doubled-depth 3D panoramic magic occurs (best seen with 3D glasses). For example, when a nearest screen-portion 3D depth is viewed aligned above that of a furthest screen-portion 3D depth--an unprecedented dimensionality of the 720-3D screen-system is presented e.g., experienced by a large-venue viewing audience. Each of the 360° interior and exterior panorama can comprise entirely different image content and/or image-segments, or two concurrent-and-complementing 360° panoramas (in 3D or in 2D). In the latter case the 360° panoramas--whether live or pre-recorded--extend seamlessly and entirely around an interior surface and an exterior surface of a LADS screen. Such imagery, whether imaged on LADS cylindrical or dome form factor screens, can be projected from each of a series of projectors, or imaged within distinct pixel array screen-segments. For a comprehensive listing of patent features see Technically Speaking below. Currently, VR / AR head mounted displays 'HMDs' are limited to an immersive first-person-video ‘FPV’ 360° viewing-experience. Soon however, VR and AR content will also be configured for viewing by, and for game interaction between, multiple players over a Head Mounted Display 'HMD' . Leading companies making HMDs have made it a top-priority that their HMD becomes a major platform for potentially scores of new VR / AR games, including team-competition eSports games. Many of these new VR / AR games will make their way into large-audience venues where eSports Championships are now attracting some of the largest viewing audiences ever. Anticipating the advent of VR / AR gaming, and a need for an immersive portrayal of such, LADS' screen-display systems are poised to stunningly display encompassing VR or AR content in LADS' proprietary 720° (and 360°) full-panoramic formats. LADS Form Factors Approach Proven to Substantially Increase Audience-Revenues -- In the large-audience venue market LADS 'center stage' display systems take aim at expanding audiences, attendance and revenues e.g., by up to 25%. How? LADS 360° cylindrical and oval screen-display form factors are complementary to the interior shape of almost all large-audience venues. Each form factor--whether employing LADS' projection and/or pixelated-array imaging solutions--substantially reduces the distance of a venue's furthest seats from a LADS screen (e.g., by 60%), which in turn, increases the closer prime-seating row-depth that completely surrounds the circumference of the centralized screen--making it ideal for entertainers to best communicate with and engage larger and much closer audiences. A realization of the audience-increasing power of this form factor led U2, on their 360° Tour, to the all-time highest-grossing concert tour yielding $772 million revenue (note: even a 20% avg. increase of which is $150M). Eco-Friendlier Too: Even lighting and sound energy requirements can be significantly reduced due to LADS screen-displays providing a significantly closer proximity to their surrounding audiences. For example, according to dictates of physics, when a given area requiring sound and lighting is increased e.g., by 2x or 4x, an exponential increase in energy output ('by the square') will then be needed: 4x or 16x sound/audio levels respectively. Thus, a LADS generally-central screen-display, lighting and sound system, being 60% closer from the furthest seats of a venue, could readily use one-fourth of the sound and lighting energy needed to produce an equivalent audio and lighting attendee-experience e.g., when a flat-screen and its furthest audience seating are typically located at opposite ends of a large-audience venue. 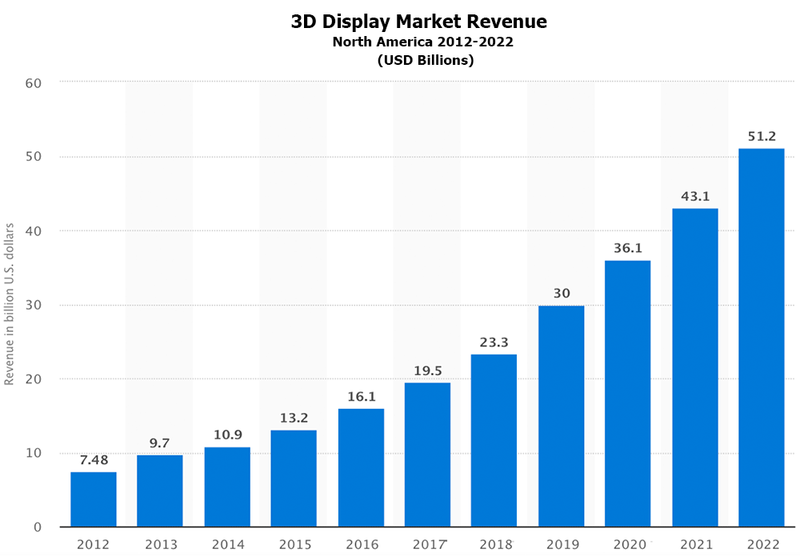 3D Display Revenues Forecasted in U.S. Revenues for 3D display systems will more than double in the next four years from $23 to $51 billion (see graph above). Smartphone and tablet makers have released products with 3D viewing capablility and more are coming soon. All of which makes 'now' the opportune time to start integrating high-profile recorded, Live-3D and 2D video content into eSports Championships, concert and events at large-audience venues, and at prime digital-signage locations. Further patented/added-value features of the LADS systems include: 2D and 3D game systems 'in-the-round' enhanced by a circularity of action; single and multi-axes screen positionings before a live audience; handheld device social-interactivity at live shows, even HD 'audience-selfies' at a single venue, or shared concurrently between two or more venues; and, downloads of screen content/video/favorite entertainers (recorded or live-streamed) onto attendees' handheld devices and onto LADS' Video Imaging Apparel and other wearables. Think: recorded and live-action concert VIA T-shirts (versus printed shirts). For a comprehensive listing of LADS high-profile display system and their patented features see 'Technically Speaking' immediately below. Such features, (among those below) already prompted several calls from the world's largest patent-licensing/venture capital company (seeking to buy the LADS '346 patent). The descriptions below provide some detail of key features of LADS' Screen-Display Systems, excerpted from the LADS™ '346 patent. portions of cylinders, cones and portions of cones; one or more standalone or display-adjacent arcs, and the like. Bringing to market 'Best-in-Class' display systems for large-audience indoor / outdoor, retail and public settings. Featuring Seamless 360º Live-3D (and 2D) Screen-Display Systems and Video Imaging Apparel 'VIA' with games, social interactivity, 3D/2D content downloads and live-streaming.